Before installing Workflow Actions Pack ensure that Workflow Manager is configured for your farm. Workflow Manager allows to create and execute SharePoint 2013 workflows. See Workflow Manager configuration guide. Download setup file and run it on one of the servers in your SharePoint 2013 farm as Farm Administrator. Follow the wizard steps. After that you have to activate Web Application level feature Plumsail Auth Service for this please open your central administration site and navigate to Application Management section, click on the link Manage web application, choose your using web application, click to the Features button on the ribbon and activate the Plumsail Auth Service feature. Next, you have to activate feature on your site. Navigate to the site, open site settings and select Manage site features. Buy Workflow Action Pack for SharePoint 2013 license for each web front-end server. Place received .license files in the root folder of all SharePoint web-applications on WFE-servers according to generated keys. Run setup file and choose Remove, then finish the installation wizard. Open web.config file (by default this file locate in C:\inetpub\wwwroot\wss\VirtualDirectories\[Web_App]\web.config) and remove all references to Plumsail.WFServices. Run setup file and install Workflow Action Pack again. Then, deactivate web application feature and try to remove the solution again. 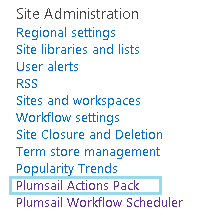 Firstly, you have to deactivate Plumsail Workflow Actions Pack feature at the site level. Download setup file and run it on one of the servers in your Sharepoint 2013 farm as Farm Administrator. Choose Upgrade and follow the wizard steps. 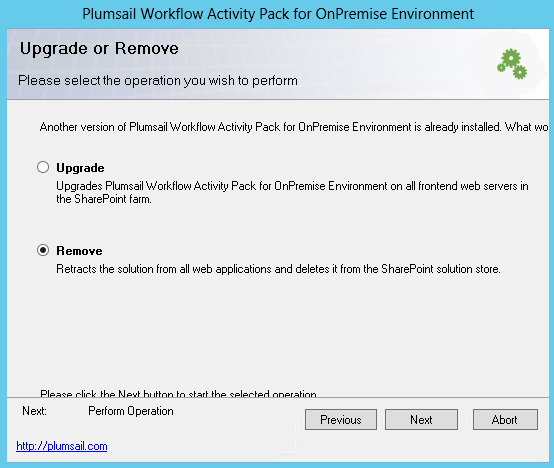 Sometimes after upgrade WSP package, you also need to upgrade your workflows. 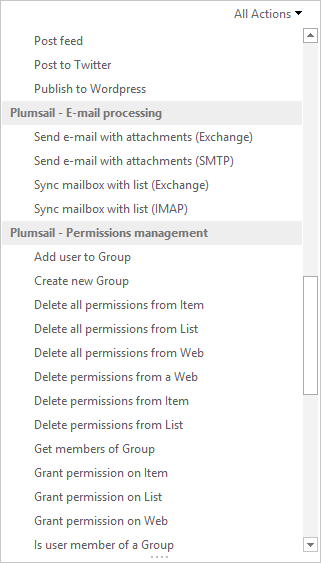 To upgrade workflows you need to navigate to Site Settings -> Plumsail Workflow Actions and click ‘Upgrade’ button for workflows where you see it. After upgrading of workflows you need to clear Sharepoint Designer cache and open it again. You may need to reopen SharePoint Designer second time, it is specific of SharePoint Designer. Or you can download and execute the bat file. After clearing the cache and running SharePoint Designer you may need to close and open SharePoint Designer one more time, then the error should disappear. We also recommend to install recent updates for SharePoint Designer 2013. This will help to avoid annoying error when configuring workflows. If you use SharePoint Designer on the same server where has installed Workflow Manager and see the message Server-side activities have been updated, please check the link. We also recommend to install recent updates for SharePoint Designer 2013. This will help to avoid annoying error when configuring workflows.